The global market for digital certificates and public key infrastructure has been witnessing a healthy rise, thanks to the improved operational efficiency at reduced costs and the enhanced security and controlled workflow associated with digital certificates and public key infrastructure. Over the coming years, the global digital certificates and public key infrastructure market is likely to witness substantial rise, expanding at an exponential CAGR of 23.60% between 2017 and 2025. The opportunity in this market is projected to rise from US$1.95 bn in 2016 to US$12.90 bn by the end of 2025. Although, the market’s future looks bright but the lack of awareness and technical competency linked with digital certificates may limit its growth over the next few years. The incompatibility among various formulation techniques, dearth of standardization, and the various ambiguities in regulations are also expected to deter the market from progressing steadily in the near future. Hardware and software are the two main types of technical solutions provided in the worldwide digital certificates and public key infrastructure market. Software solutions, which provide content validation to the electronic documents, have been leading the global market and are expected to remain on the top over the forthcoming years. With the increasing uptake of such software solutions, this segment is anticipated to witness substantial growth in the near future, ensuring its dominance. Digital certificates and public key infrastructure services are deployed predominantly on-premise or on cloud. Currently, on-premise deployment model is much popular than the cloud-based model. However, with the growing internet penetration, the letter, in which cloud-hosting signing services are utilized to sign the documents digitally, is expected to overtake the former over the forthcoming years. North America, Asia Pacific, Europe, the Middle East and Africa, and South America are the prominent regional markets for digital certificates and public key infrastructure across the world. North America emerged as the dominant regional market among these in 2016 with a contribution of US$678.8 mn to the overall revenue generated in this market that year. Researchers expect this regional market to continue its dominance over the next few years. The presence of a large pool of leading players, such as Verisign and Comodo, and major browser makers, such as Apple and Google, in this region is likely to influence the North America market for digital certificates and public key infrastructure substantially in the near future. The U.S. and Canada have surfaced as the key domestic markets for digital certificates and public key infrastructure in North America. Among other regional markets, Europe is expected to witness a significantly higher progress in terms of size as well as revenue over the forthcoming years, thanks to the rising number of certificate authorities and the growing Internet penetration in this region. Germany, France, the U.K., and advanced economies of Western Europe are expected to boost the Europe market for digital certificates and public key infrastructure considerably in the years to come on the grounds of the increasing number of web domains and certification authorities in this region. GMO GlobalSign Inc., GoDaddy Group, Verisign Inc., Gemalto N.V., Comodo Group Inc., Signix Inc., Ascertia, Secured Signing Ltd., Docusign Inc., Identrust Inc., Kofax Ltd., Entrust Datacard Corp. are some of the key players operating in the global digital certificates and public key infrastructure market. This report on the global digital certificates and public key infrastructure market provides analysis for the period 2015 – 2025, wherein 2016 is the base year and the period from 2017 to 2025 is the forecast period. Data for 2015 has been included as historical information. The report covers market dynamics including drivers, restraints opportunities, and trends expected to influence the global digital certificates and public key infrastructure market growth during the said period. Technologies that are playing a major role in driving the global digital certificates and public key infrastructure market have also been covered in the study. The study provides a comprehensive analysis on market growth throughout the above forecast period in terms of value estimates (in US$ Mn), across different geographies. The report also covers specific key trends that are prevailing in across different geographies. 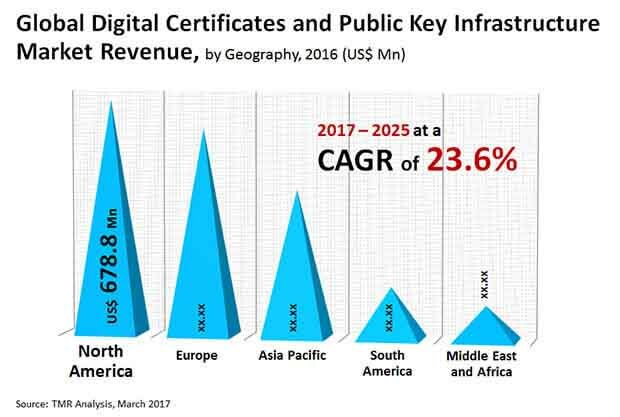 The global digital certificates and public key infrastructure market has been segmented on the basis of solution, deployment model, application and geography. Based on solution, the market has been divided into hardware and software. Hardware solutions use digital certificates for identity authentication for distributed devices. Embedded digital certificates in USB and other data storage devices are encompassed in the scope of study. Software solutions are used to validate the contents of the electronic documents like emails, PDF and word processors. Based on the deployment model, the market has been divided into cloud-based and on-premises. In cloud-based deployment model, documents can be signed digitally with the help of cloud hosted signing services. Here the user is not required to have a locally installed digital certificate software. Whereas in on-premise deployment model, digital certificate solutions are locally based and is not required to be connected to the cloud. On the basis of application, the global digital certificates and public key infrastructure market is segmented into Banking Financial Service and Insurance (BFSI), Real Estate, Education and Research, Healthcare and Life Sciences, Human Resources, Legal, Manufacturing, Government and Defense and Others. Geographically, the report classifies the global digital certificates and public key infrastructure market into North America, Europe, Asia Pacific, Middle East & Africa (MEA), and South America; the regions are analyzed in terms of market revenue. Furthermore, region wise prominent countries covered in the report includes the following - the U.S, Canada, Germany, France, the U.K., China, Japan, India, Australia, UAE, South Africa, Saudi Arabia, Brazil and Argentina. The report also includes key industry developments in the digital certificates and public key infrastructure market over the past years and have significantly impacted the industry as a whole. Porter Five Force analysis is also included in the report. The report also covers segment wise market attractiveness analysis across all the geographies. Furthermore, the report also provide market share analysis for key players based on their revenues generated in 2016, the report also takes into account the number of SSL certificates issued by the major player in past few years. The key players profiled in the global Digital Certificates and Public Key Infrastructure market include GMO GlobalSign, Inc., GoDaddy Group, Verisign, Inc., Gemalto N.V., Comodo Group, Inc., Signix, Inc., Ascertia, Secured Signing Limited, Docusign Inc., Kofax Ltd. (A Lexmark Company), Entrust Data Cartd Corporation and Identrust Inc.